Global shipping must take a leading role in the climate change debate and develop a more collaborative approach to business whilst reducing its own greenhouse gas footprint and emissions that affect air quality. 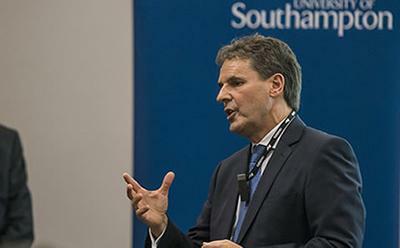 That’s the message delivered by Dr Grahaeme Henderson, Vice President, Shipping & Maritime at Shell, as he delivered a Distinguished Lecture at the University of Southampton. In his lecture "The Shipping Challenge: Carry More. Emit Less", Dr Henderson outlined his vision of a world where the shipping industry will embrace new technologies and work more collaboratively to deliver significant reductions in Greenhouse gasses and emissions that impact air quality. “Shipping will be seen as the efficient, cohesive and high technology industry,” argued Dr Henderson who is responsible for Shell’s international shipping and maritime and activities and recently appointed Adjunct Professor with the University’s Southampton Marine and Maritime Institute (SMMI). “For me, innovation is the most important factor in ensuring that we address the challenges ahead. This is about more than new technology; it’s about new ways of doing business. Technology, although very important, will not be enough on its own to address the challenge. A much more collaborative business model is also needed to align agendas to make the shipping industry a truly efficient, joined up operation. “We need to seamlessly work together across the industry, with ship owners, charterers, shipyards and brokers, and with Governments, regulators, universities and classification societies to develop a clear, agreed pathway and develop new ways of working, and speeding up the technological advances that aid us in meeting the challenge,” Dr Henderson continued. “We have seen collaboration work in our own industry. One example is in the area of safety where industry has considerably improved its safety performance. This has taught us that when the right framework and governance is put in place and everyone has the same objective; it is possible to make significant inroads into meeting a particular challenge. The shipping industry can replicate the same ways of working to reduce its environmental emissions.